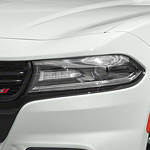 There are very good reasons why the 2018 Dodge Charger has become a popular mid-size sedan. The Charger allows you to have fun and enjoyment while maintaining safety as you drive. And the exceptionally advanced technology helps you! The technology features are all part of the Charger's media hub, which was designed to keep a driver - well, in charge! Media hub technology features include Uconnect Voice Command for hands-free calling, the navigation system, and the radio. Additionally, the Bluetooth Streaming Audio capability helps you stay entertained when using a compatible media device. Although the features are convenient, they provide exceptional safety benefits by helping to keep your focus on the road. The Charger has dual charging USB ports so that you can stay "powered-up" regardless where you're traveling. In addition, the Charger is equipped with a 12-volt power outlet. Stop by Greenwood Auto's showroom in Cortland and take a test drive soon!